Lyn Tabora, Jerwin Ancajas, and Carlo Biado head the list of candidates for the PSA Athlete of the Year award for 2017. The PSA Awards Night will night will be held on February 27 at the Maynila Hall of the Manila Hotel. THE Philippine Sportswriters Association (PSA) will hold its annual Awards Night on February 27 as it continues to preserve a time-honored tradition of feting athletes who shine here and abroad and make the nation proud. 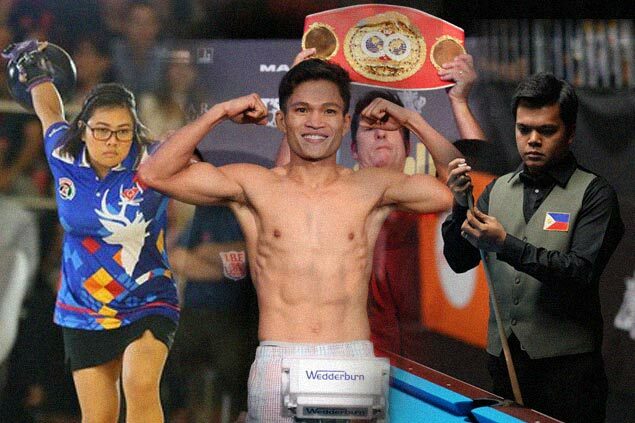 Billiards king Carlo Biado, bowling queen Krizziah Lyn Tabora and boxing titlist Jerwin Ancajas head the list of athletes to be feted during the two-hour affair - their reward for doing their share in making the year that’s about to end a memorable one. Biado, Tabora and Ancajas have also been named by the PSA board of directors in its recent meeting as candidates for the Athlete of the Year, the highest accolade to be given during the rites scheduled at the Maynila Hall of the historic Manila Hotel. The number of nominees for the top award may increase to four if another Filipino boxer in International Boxing Federation light-flyweight champion Milan Melindo wins his unification bout with WBA titlist Ryoichi Taguchi on New Year’s eve in Tokyo, Japan. “It’s that time of the year again when the PSA throws a party for the best and brightest in Philippine sports,” said PSA president and Spin.Ph editor Dodo Catacutan. “These athletes deserve nothing less,” he added. Several prominent officials and friends of sports led by Ramon S. Ang of San Miguel Corp., Manuel V. Pangilinan of the MVP Group of Companies and Judes Echauz are also expected to get recognition and share the limelight with the athletes for their boundless help to local sports. According to Catacutan, the 23 gold medalists in the Kuala Lumpur Southeast Asian Games and the 20 winners in the ASEAN Para Games also held in the Malaysian capital will also be given appropriate honors in the rites where former sportswriter and boxing analyst and now Agriculture Secretary Emmanuel ‘Manny’ Pinol will be the guest of honor and speaker. “It’s a great honor that a former colleague in the sports beat who has risen to prominence will be with us on the night when we fete our top athletes,” said Catacutan. Organized in 1949 and considered as the oldest group of media practitioners in the country, the 80-member PSA has also started seeking the help of its old and new friends in sports like San Miguel Corp., Milo, Tapa King, Cignal, Philippine Sports Commission, Mighty Sports, Rain or Shine, and GlobalPort to stage the affair. The 25-year-old Ancajas, a native of Panabo, Davao del Norte who fights under Manny Pacquiao Promotions, made it to the short list of AOTY candidates for successfully retaining his IBF junior bantamweight title three times, the last against Irishman Jamie Conlan whom he stopped in the sixth round in Belfast, Ireland. The last two months of 2017 also proved kind to two other Filipinos athletes in Tabora and Biado. In one cold night in November in Hermosillo, Mexico, Tabora went hot, winning the Bowling World Cup and ending a 14-year title drought in the tournament where Filipino bowlers had big successes in the past. In winning this one, Tabora became the fifth Pinoy to capture the BWC title after the great Paeng Nepomuceno, the late Lita dela Rosa, Bong Coo and C.J Suarez. Not to be outdone was Biado, who clinched the World 9-Ball crown in Doha, Qatar in mid-December to cap an unforgettable season that saw him also top the same event in the World Games and in the KL SEA Games. Biado, 34, joined the legendary Efren ‘Bata’ Reyes (1999), Franciso ‘Django’ Bustamante (201), Ronnie Alcano (2006) and Fil-Canadian Alex Pagulayan (2004) as Filipino champs in what is considered as the premier 9-ball tournament in the world. Special awards like Mr. Basketball, Ms. Volleyball, President’s Award, National Sports Association of the Year, will also be handed out.